A #1: A proper diet should be 50% protein, 25% fruits, and 25% vegetables. There are many acceptable diets that you can follow, but it should adhere to that breakdown. Q #2: What do I need to buy them as in toys, and what type? Bird or hamster? Or maybe anything specific you recommend I should buy? A #2: Any toys that are safe for a toddler would be safe for sugar gliders. You can get bird or hamster toys, or even toys made for toddlers. Just stay away from cat toys because catnip is toxic to gliders. You should definitely get an exercise wheel that is safe for gliders (no center bar because their tails can get injured). The stealth wheel is a popular one. 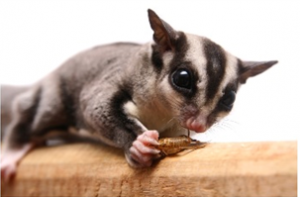 Q #3: What age should I buy the sugar glider…baby or adult? A #3: It may be easier to bond with younger gliders, but there are also many lovable adult gliders that are in need of homes. I highly recommend adopting a glider from a rescue organization if you can. If not, make sure to go through a reputable breeder. Q #4: Do they bite? Does it hurt? A #4: Sugar gliders can bite, and it does not feel good! It can puncture your skin if they bite hard enough. Q #5: How many times should I feed them in a day? A #5: You only need to put food out for them one time at night when they wake up. Make sure to remove any leftovers in the morning. You can also give them little treats throughout the day if they wake up. Q #6: How do I handle their poo and urine? A #6: Sugar gliders cannot be potty trained, so you will have to clean up after them. You will need to change out the removable tray in their cage pretty regularly. They can also have accidents when they are out playing, so you will just have to look out for any accidents to clean up. Q #7: Can they actually fly? A #7: Sugar gliders do not actually fly, but they glide. The patagium is the gliding membrane that attaches from the fifth finger to the first toe. This stretches out when they jump so they can glide through the air. In the wild, they can glide up to 150 feet from tree top to tree top as they search of food. Q #8: Do sugar gliders get along with cats? A #8: Sugar gliders do not get along with cats. Cats will go after gliders because they are prey animals that move quickly and attract the predator instinct in cats. Gliders will not feel safe around cats and can become stressed easily. 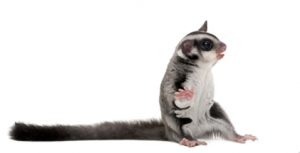 Q&A: Does it matter what age you are to own a sugar glider? Q: I am thinking about getting a sugar glider, but I have some questions. Do you need to get two gliders, because we went to a pet store and he said you need to get two, because apparently they could easily die of depression! A: You do not need to get two gliders if you have enough time to devote to a single glider, but it is better to get two. I have one sugar glider, but I have to spend a lot of time bonding with her. 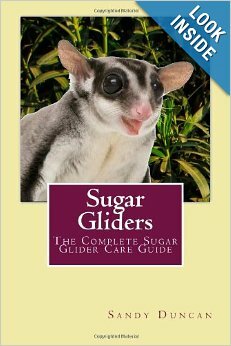 Please read my advice for a first-time sugar glider owner, in which I discuss how to decide whether to get one or two gliders. Q: Can you train them to stay on you, some say bonding is just having them with you is that true? A: Yes, you can train them to stay with you, but you should also allow them time to play and explore the environment. Please read my post on the best way to let your sugar glider out of the cage for more information. Play time is also an important part of bonding. Please read my post on sugar glider bonding for more information. A: Sugar gliders can make great pets for people of all ages. What I would ask a younger person such as yourself is how much are your parents willing to help? Sugar gliders are definitely a large responsibility. Not only do you need to have the proper finances for them (buying a glider, cage, paying for vet appointments and food), but you need to have the TIME for them. As a 6th grader, your life is going to change a lot over the next 10-15 years, which is the lifespan for a sugar glider in captivity. You need to be certain you are willing to commit to a glider for that long. Your glider/s will need the proper time and attention to live a happy life. Are you ready for this commitment? Perhaps you can spend the next month evaluating how you spend your time and if you really would be able to wear/play with your glider as much as needed. I’d like also to share with you my own decision to get a glider and how it has worked out for me over the last 5 years. I was a student in college and I spent a lot of time (day and night) studying. This was kind of lonely for me and I thought I could use a friend. I got my sugar glider, and as I thought, she was a perfect companion. I took her to class with me during the day while she slept, and at night she ran around my room while I studied. Since I’ve had Pokey, I’ve worked at different jobs, changed my school schedule, and moved to a different state. Even when my life changes, Pokey’s needs remain the same. It was very hard on her when I started working full time. If I didn’t know I’d be going back to school, I might have gotten her another sugar glider friend to keep her company. Now I’m back in school and I have more time for her, but eventually I’m going to have to go back to work. I believe at some point down the road, I will need to get her a friend. It isn’t fair to leave her home for 9-10 hours a day with no company. So, another thing I would ask you is do you see yourself being able to care for a single glider properly? Or would it be better to have two gliders? Two gliders may be double the responsibility, but if you don’t have to worry about always being able to wear your glider and play with it, might it be worth it to you to have two? This is an important decision to make so I would think about it seriously before you make any decisions. Talk with your parents some more about how much they are willing to help and what kind of things they expect from you. Who is going to clean the cage? Who will feed the gliders at night? How will you get to the store to buy mealworms, fruit, vegetables, etc.? Who is going to take the glider to the vet if necessary and pay for the bills? I would say, with help from your parents, you should be able to care for a glider or gliders, but it might be a little too much responsibility on your own. Please let me and the readers out there know what you decide, and how it goes. Good luck! UPDATE: I have recently added a second glider. I did not have enough time to devote to my single glider and she became very lonely. The biggest problem was when I had to travel, she would start over grooming from the stress and got a lot of bald spots. I decided adding a second glider would be best, but it has not been easy bonding the two of them. I am still going through the process and will be blogging about it.